My doctor prescribed levofloxacin for a sinus infection prior to leaving for my honeymoon. I took the first dose the first night and experienced terrible insomnia, anxiety and panic attacks. I called my doctor who told me I should be taking the dose in the morning to avoid insomnia. I continued my dosage as prescribed and only suffered insomnia one additional night and stopped having any sleeping problems. However, I began feeling tingling sensations in my feet along the heels and even a week after I've stopped am still feeling tingling sensations all over my body as well as well the occasional anxiety attack (which I never had before.) I started researching and am now extremely worried that I've done permanent damage to my CNS and concerned I will experience any issues with my tendons. I am a fitness instructor and a distance runner so I am afraid this will permanently affect my life personally and financially. Do you know if there is a correlation to the tingling I'm feeling and tendonitis or ruptures? Would these side effects likely clear? Do you have an idea in terms of timing on when I should stop worrying that I might have additional side effects? Is there something I can take to supplement any deficiencies I'm experiencing? Such as magnesium pills? All I know now is that I'll never go to my current doctor again and will do a lot more extensive research prior to taking any prescribed medications! That's a smart move, not going back to that doctor. Experiencing significant insomnia, anxiety, etc after a single does is NOT a good sign. Especially if it's a fluoroquinolone with known side effects and downsides (that that doctor would know if he spent 5 minutes researching what he's prescribing instead of just listening to the pharmaceutical rep). Did the doctor bother to determine whether the bronchitis was bacterial, viral, or fungal? Or just irritation/inflammation? 'Permanent' is relative. If you don't replete the nutritional depletion, then problems can be permanent. But just becasue a problem has been around for, say, 10 years, doesn't mean that it's permanent nor irreversible. Maybe you situation is 'permanent', but from what you've said so far, that's not my first impression. In comparison, your symptoms are mild. That's a big plus. 2. Rupture can happen with or without tingle. Anything can happen, and side effects look like a lot of different scenarios. 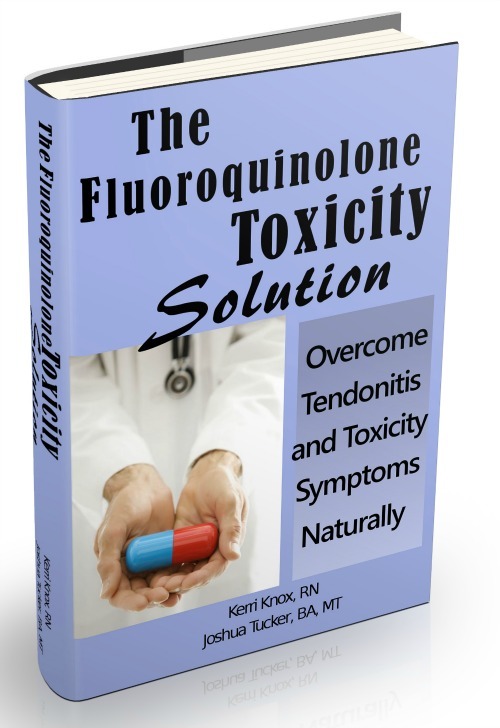 My highest suggestion is my The Levaquin Tendonitis Solution ebook. There is no magic bullet, you need a complete plan of attack that deals with all the variables. If all you did was magnesium, that may or may not get rid of your symptoms. It just depends on what you have going on. Magnesisum is a primary focus, as one of the main actions of fluoroquinolones like Cipro, Levaquin, Levofloxacin, Avelox, etc, is magnesium depeletion. 3. You asked "Would these side effects likely clear? Do you have an idea in terms of timing on when I should stop worrying that I might have additional side effects?" Maybe they'll clear. Without doing anything, people generally fall into two categories. They either get better within a year, or they don't. I'm not a fan of 'not doing anything'. I'm a fan of going after and fixing the problem to whatever extent is available'. You're a long way from being out of the 'worry' window/time line, IMHO. You might get better tomorrow, but I wouldn't put money on it. You need to, IMHO, get to work. There is some overlap in mechanisms as each negative factor causes other negative factors. 5. As a separate but possibly related topic, why did you have bronchitis? Is that a normal thing? I have a history of bronchitis, starting at age 25. Turns out, for me, that's a function of gluten intolerance. Now when I have more than a little gluten, I feel it immediately in my chest/lungs. Maybe yours was an infection, maybe just inflammation/irritation. But it points to a lack of health in your system. And right now it's all about making your system as healthy as possible. I was prescribed 500 MG of levofloxacin daily for 21 days for my sinus. Four days later swelling in my knees. Did not realize it could be the rx. Seven days later could hardly walk, also pain in upper arms. Was trying to tough it out to finish the rx. 11th day, one hour after taking medication, I felt so bad in general that I had to go to bed. I could not get up for anything for hours. The rest, icing the knees,and using a tens unit on my knees and upper arms has helped. I generally do not feel well. I tire very easily. I just do not have the strength anymore,and I do not seem to be improving. My last dose was on the 11th day. I have been off the rx for 3 weeks and the knees are better, but not good yet. My wellbeing is still not good. I knew for sure it was the rx about 24 hours after my last dose, because there was a noticeable improvement in my knees. I had got to the point I could barely stand by day 11. I haven't been able to get back to my normal routine. I feel I need to be supplementing with vitamins, but I am not sure which ones. Unfortunately, that is a very typical response to fluoroquinolone antibiotics. As far as figuring out the vitamins etc, I suggest the Levaquin Toxicity Solution (previously The Levaquin Tendonitis Solution). The program lays out a complete plan and tells you exactly what to do nutrition/supplement-wise. One of the big mechanisms of Levofloxacin is that it depletes your body....which then causes even more depletion, and why most people don't recover when doctors treat their symptoms like some mysterious disease or a physical issue. Its not a physical issue, it is a systemic issue. The mechanism is reversible (but is more detailed than I can say here), and we look forward to working with you to get you back on your feet.